This particular application is used in batching or mixing of multiple chemicals. By measuring the viscosity, you can determine when to stop adding a liquid to the mix. As shown here, the table can be lifted so that the probe reaches the liquid in the tank. The probe can also be brought down into the liquid. Once the probe is in the liquid, a certain amount of tension is required to pull the probe back out. The thicker the liquid, the higher the viscosity is and the harder it is to pull the probe out. The load cell measures this tension and transfers the data to a display. 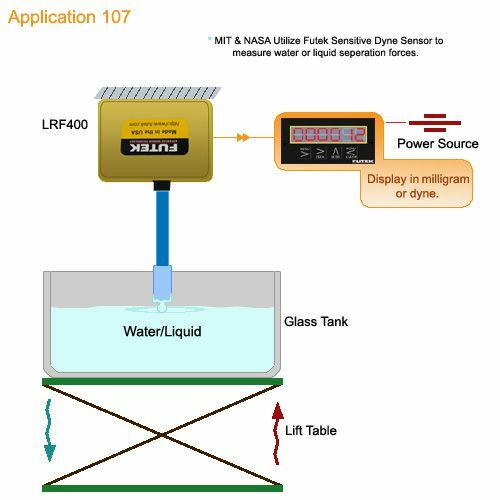 Both MIT and NASA (Glen Research Center Cleveland) have utilized Futek’s Sensitive Dyne Sensor to measure water or liquid separation forces.